Explanation: The bright light at the end of this country road is actually a remarkably close conjunction of two planets. After sunset on August 27 brilliant Venus and Jupiter almost appear as a single celestial beacon in the night skyscape taken near Lake Wivenhoe, Queensland, Australia. 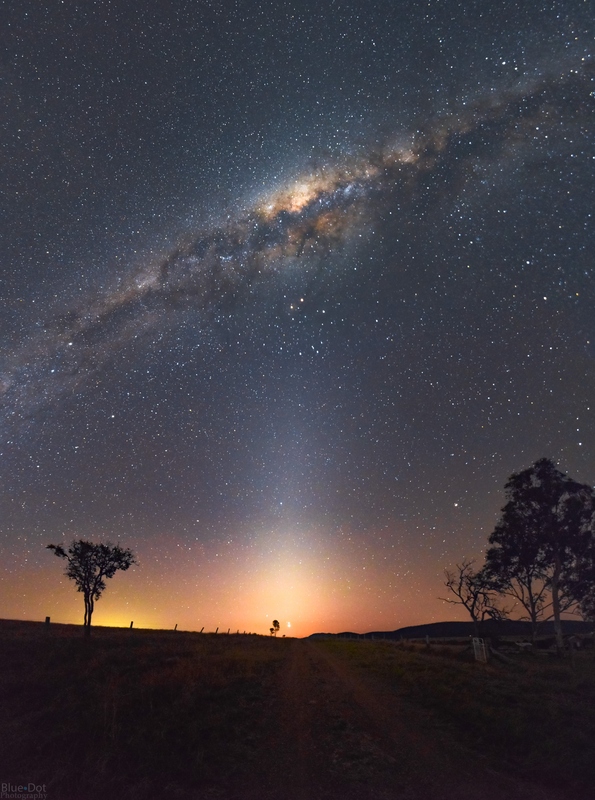 A spectacular vertical panorama from the southern hemisphere, it shows the central Milky Way near zenith, posed on top of a pillar of Zodiacal light along the ecliptic plane. Of course Mars and Saturn are near the ecliptic too, just below the galaxy's central bulge. Above and left of a tree on the horizon, fleeting planet Mercury also adds to the light at the end of the road.